Ever since hearing about Ico and Shadow of the Colossus's creator Fumito Ueda's newer game Last Guardian in 2009 announcement, we've been on a downward spiral of setback after setback. Years of delays and the disappointment that comes with it. After years of anticipation, we now get news that it may arrive at E3. I've been thinking for a while that, Sony was saving it for PS4. 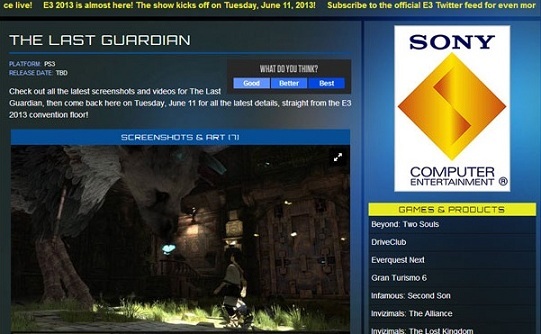 (Click to see other Last Guardian posts) If this is true, and it does show at E3- I hope all the secret work they've been doing is graphical enhancements and a porting it to the PS4 as a launch title. Is this the actual announcement we've waited 5 years to hear? I certainly hope so.